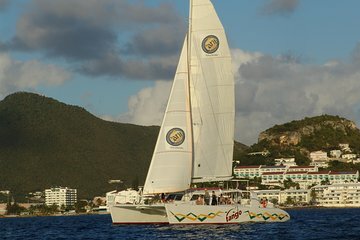 Assista ao pôr do sol e jante pratos crioulos a bordo de um catamarã durante esta excursão de 3 horas saindo de St Maarten. Tome bebidas no bar aberto e coma aperitivos de cortesia enquanto o sol se põe abaixo do horizonte. Assim que o crepúsculo cair, desfrute de um jantar crioulo em estilo buffet, seguido de sobremesa e rum caribenho. Bata a pista de dança para as ilhas enquanto o barco navega de volta para a marina. Vá até o Pelican Marina para embarcar no 'Tango', um catamarã de 19 metros. Suba a bordo e encontre um lugar para se sentar e relaxar. Conheça a sua tripulação amigável e os outros passageiros enquanto você se aproxima do bar aberto e mastiga lanches. Sinta a brisa do Caribe em seus cabelos e o sol da tarde em sua pele, enquanto o impressionante barco navega pela costa de Saint Maarten. Assista ao famoso pôr do sol do Caribe pintar o céu uma dúzia de cores. À medida que o sol se põe em direção ao horizonte, certifique-se de ter sua câmera à mão para tirar fotos fantásticas. Regresse a Simpson Bay e, quando o 'Tango' ancorar num ambiente bonito, jante num jantar crioulo em estilo buffet. Escolha entre costelinhas, frango crioulo, saladas, pão, feijão, banana e arroz. Depois do jantar, cave a sobremesa e tome parte do rum local. Dance o resto da noite fora para as batidas caribenhas. O cruzeiro de 3 horas ao pôr do sol termina quando o barco atraca na Pelican Marina. This sunset dinner cruise was awesome. A beautiful sunset, delicious food and great music made for a memorable night. Highly recommended. This was my favorite excursion. The ship, the crew, and the captain were off the charts and I would highly recommend this excursion if you want a nice evening activity to cap off the day. It was so fun and beautiful...The sunset was gorgeous!! The sail boat was very clean.. Food and drinks were delicious... Staff was so friendly and we danced as we sailed back to shore!
. Well worth the price. This was AMAZING and well worth it. I will be back! This sunset cruise was absolutely fantastic! The crew was very lively and very friendly and everyone that we met were also very friendly and welcoming. The food was good and the open bar was a nice bonus! 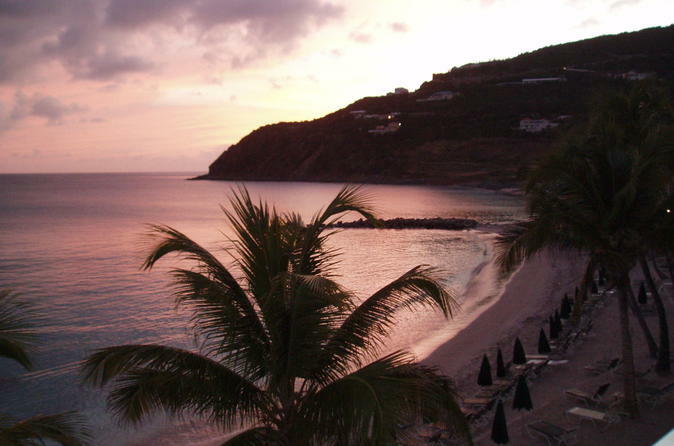 A very nice view for anyone wanting to see the sunset over the caribbean horizon. 10/10 recommend. Amazing staff that was very attentive. The sunset was gorgeous, and food was very tasty! A must do for anyone visiting the island. One of my favorite parts of our trip! Highly recommend! Experience was great...food was good, crew was great and the view was spectacular. We had a blast on this tour!! Lots of fun, music, food, and rum punch.